Most people don’t think too much about their readers (or search engines) when coming up with content ideas. They just write about whatever they fancy. If this sounds like you, then you need to get smarter with your content, at least if you want your blog traffic to grow. In the past three years, we’ve grown Ahrefs’ blog from ~12K to ~190K monthly visits. And roughly 1/2 of our traffic comes from organic search. In this post, I’ll walk you through the exact SEO copywriting process that fueled this growth, from start-to-finish. DISCLAIMER: This post is 100% based on our experience at Ahrefs. I will not be talking about things like LSI keywords, TF-IDF, or any other super-technical “tricks.” We don’t currently apply any of those tricks when writing content for the Ahrefs blog, and we still get awesome results. So I will instead try to articulate the process we use and why we believe it works. DISCLAIMER #2: I should also point out that we cannot possibly attribute all of our growth and success to our copywriting process. There are numerous factors at play here (links, our existing “authority,” etc. )—our approach to content is just part of the puzzle. SEO copywriting is the art of writing content that ranks high in Google. It involves pairing SEO and copywriting techniques to create content that appeals to both search engines and visitors. Build “linking triggers” into your content. Sounds simple, right? But how do you actually do this? Well, that first part is relatively straightforward. Just look at how much traffic the current top ranking pages get for the topic you have in mind. For example, let’s say I was planning to put together a list of the best protein powders. I’d enter a rough description of my content (“best protein powders list”) into Keywords Explorer and see how much traffic the top ranking pages get. Looks like this topic definitely has high organic traffic potential. But what about something a little more niche, like a guide to stopping referral spam in Google Analytics. This isn’t to say that one of these topics is “better” than the other. It’s subjective and depends on your business. For us, it wouldn’t make sense to write about protein powders because we provide SEO tools. So despite having lower organic search traffic potential, it would make more sense for us to target the second topic. But finding a topic with organic search traffic potential is the easy part. The hard part is putting together the best piece of content on that particular topic and attracting links to it. To do this, you have to appeal to two distinct audiences: readers and linkers. Let me show you how we do this. We write (almost) every blog post around a primary keyword. I’m not going to go into our keyword research process here. If you want to know more about that, I recommend reading this post. But suffice it to say that we only target keywords on the blog that have so-called informational intent. There’s no point wasting time, energy, and (possibly) money writing an epic blog post about X if this isn’t even the type of content that Googlers want to see. But how do you know what people want to see? If the SERP is dominated by blog posts (as it is here), you can be relatively sure that this search term has informational intent. But it’s not always this clear-cut. Looks like it’s a pretty even mix of blog posts and sales pages, so what’s the search intent here? In these situations, you’ll often have to use your best judgment. But you can sometimes glean additional insight by looking at the SERP position history graph in Keywords Explorer. So if you notice that a particular “type” of page seems more volatile than another—for example, perhaps transactional pages are jumping in and out of the SERPs whereas informational pages are holding steady—then this may further help you to infer search intent. Even if you’re not 100% sure, the fact that some informational (i.e., blog posts) are ranking for your target term is a good sign—it shows that some users are looking for that. Sam Oh goes into more detail about this concept in our Keyword Research video series. Knowing what type of content users are looking for is just the tip of the iceberg. I’m sure you don’t need me to tell you that there are hundreds of thousands, if not millions of results for pretty much anything you search for in Google. Even if we assume that only 1% of these results for this query are “informational,” that’s still 18K+ pages that fulfill basic search intent and thus, have passed the first hurdle on the road to ranking. But only a handful of these results rank in the top 10 (obviously), so now we need to understand why and how the current top ranking pages earned their place on page #1 (hint: all of them are there for a reason). So the first thing we usually do is to look for any commonalities in the SERPs. 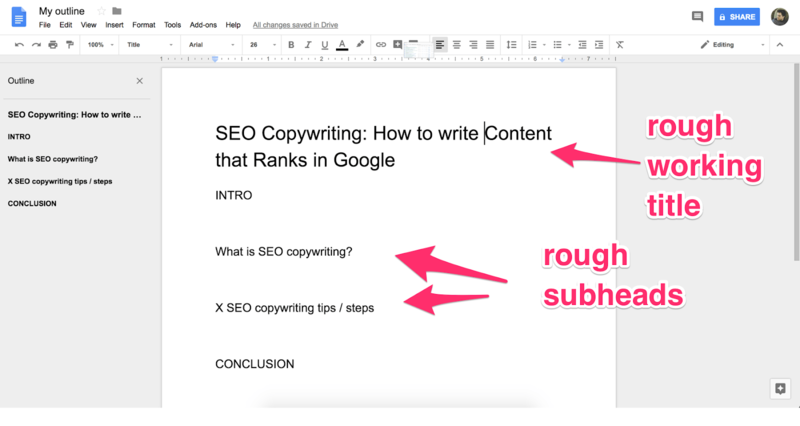 For “SEO copywriting,” I see a lot of “how to” guides and lists of tips. Let’s also take a quick look at the “people also ask” box in Google, as this will give further insight into the questions and problems these people have. 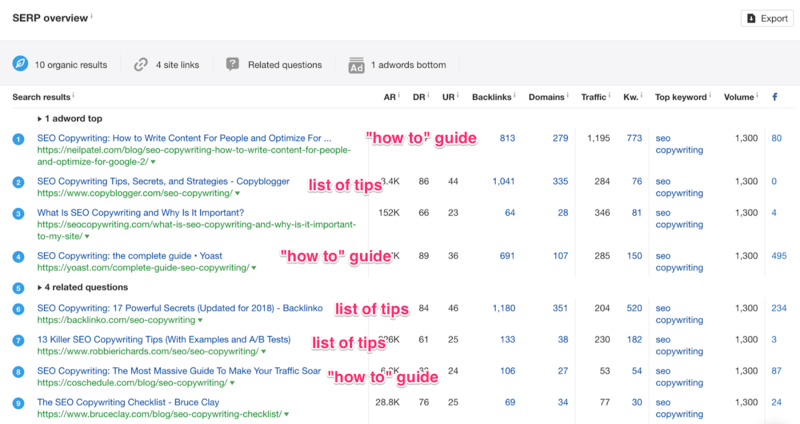 Again, it looks like people are wondering what SEO copywriting is and how to do it. I guess that’s why there are a lot of “how to” guides ranking in the SERPs. Grab 4–5 of the top ranking “informational” pages from the SERP overview and paste them into Ahrefs’ Content Gap tool. Leave the “but the following target doesn’t rank for” field blank. I also recommend starting with the “show keywords that all of the below targets rank for” option. If there are no results, try reducing the requirement on the drop-down. 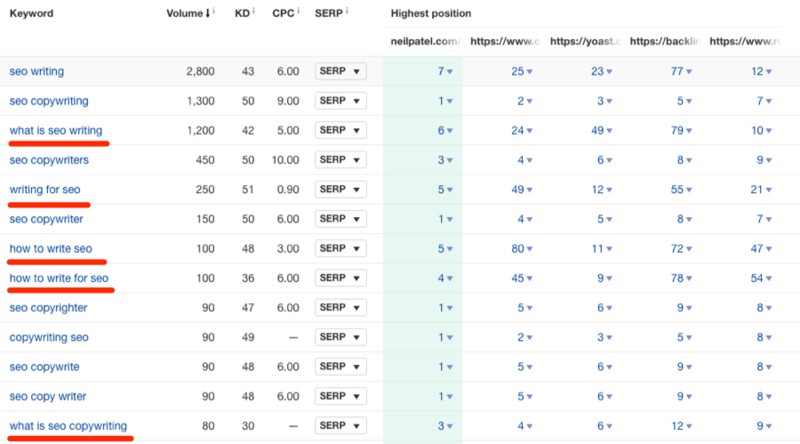 You will now see the keywords that all of those pages rank for. Once again, there seems to be a lot of “how to” and “what is…” type queries (they have decent search volumes too). Make a note of any long-tail keywords that might be worth optimizing for. You can also use the Also rank for, Questions, and Having same terms reports in Keywords Explorer to uncover long-tail keywords. Check out our long-tail keywords guide to learn more. They have a website and want to know how to create content that ranks in Google: This may seem obvious (I mean, that’s what SEO copywriting is, right!?) but actually, we needed to look at the SERPs to know this for certain. It could have easily been the case that these people were looking to learn how to become an SEO copywriter (i.e., as a job) or even how to hire a copywriter. On the whole, the SERPs tell us that this isn’t the case. They probably aren’t 100% sure what SEO copywriting is. My guess is that they’ve heard the term in another article about SEO and, having decided that it may be the answer to their overarching problem (more on this in a minute), went ahead and searched for this term in Google. They almost certainly want a how-to guide or at least a list of actionable tips. I know this because the vast majority of pages in the top 10 are “how to” guides or lists of tips. This is yet another indication that this person is new to SEO copywriting and wants someone to walk them through what they need to do. Based on these assumptions, I’m pretty certain that the overarching problem to which these users are facing is how to create content that ranks in Google. Let’s open a fresh Google doc and use this information to start creating a (very) rough outline. For now, my only guidance is to include your primary keyword (or some variation of it) in your working title and to sandwich the “meat” of your post between an intro and conclusion. All of this is subject to change (and probably will as we delve deeper) but it’s a good starting point. At least we’re putting pen to paper and are no longer staring at a completely blank document! If Google is consistently ranking the same few pages in the top 3–5 positions for your target keyword, there’s undoubtedly a reason for that. But actually, it never comes down to only one reason—it’s many. Links, exposure, behavioral factors, etc.—all of these contribute to a page ranking high in the SERPs. So the goal now is to try to further understand why these pages rank where they do. Once again, SERP overview is the best place to start this analysis. I’m ignoring the result from seocopywriting.com (#3) for this because I believe it’s somewhat of an outlier due to the exact-match domain. Right off the bat, I can see that all four of the top ranking pages has a fair few referring domains—between 107 and 335. I can also see that they reside on high-DR websites. For us, this isn’t a problem because we’re also a high-DR site (currently DR 86). 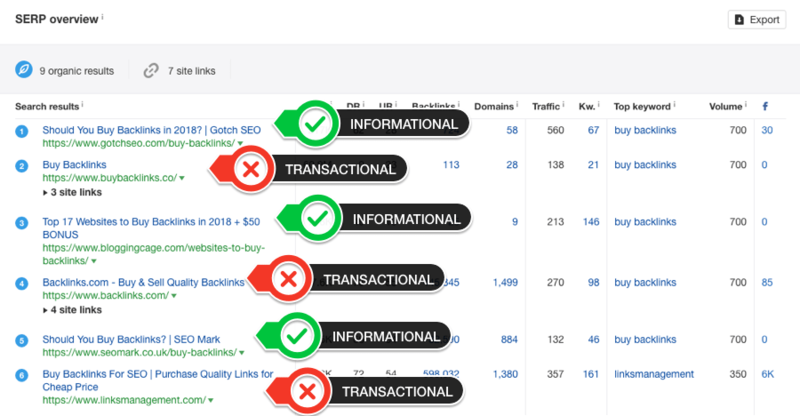 But if you were trying to rank for this keyword with a lower DR site, you would probably need even more page-level backlinks than these pages to stand a chance. Reason being, the URL Rating (UR) of a page on a high-DR site is usually higher because more so-called “link equity” will flow to individual pages via internal links. This tells me that the quality of content here is probably quite good. After all, why would hundreds of people link to poor-quality or mediocre content? They wouldn’t. It also tells me that we would likely need a similar amount of links to our page to stand a chance at ranking. But to get a real sense of “content quality,” we need to review each of these pages manually. Doing this not only helps us to understand why these pages rank where they do, but it also allows us to build up a sense of the commonalities between the posts (i.e., things they all talk about) and the kind of language they use. I’m also on the lookout for any good or bad points relating to freshness, comprehensiveness, relevance, accuracy, and readability—this helps to inform the amount of effort that may be required to beat them regarding their actual content. Let’s do a manual review of the current top-ranking page, which comes from neilpatel.com. First things first, I’ll give the post a quick skim and see how well-designed and readable it is. In other words, is it formatted nicely (images, lists, videos, internal links, etc.) or is it a daunting wall of text? I can see straight away that Neil’s post is formatted well, so it’s a “pass” in that department. I can also see from the sheer size of the guide that it’s pretty comprehensive. Next, I want to know how up to date this piece is. I can’t see a publish date on this post, but I did notice what I assume is some very old advice about keyword density. Google officially increased the visible length of meta descriptions in the SERPs last year. Despite the comprehensiveness of the article, I’d say relevance is a little “off” too. For example, the article states “site speed” as one of the “6 elements of SEOcopywriting that matter.” It’s #1 on the list too! I’m not sure if it’s just me, but I don’t really see what this has to do with SEOcopywriting. Let’s also check the intro. This is a little long and quite wordy. But I think it does quite a good job of setting the stage for the article and letting the reader know what they should expect. I recorded all of these positives and negatives in a spreadsheet (for this post and other top-ranking pages). Doing this helps me to build up a picture of issues that should be rectified in my post in order to ensure that it’s the best, most deserving result. I then combined these findings with my own ideas to “flesh out” the outline for my post. 4. Find a unique angle, then draft your post! No matter what you’re writing about, I can guarantee that there are already a million articles on that topic. So how can you possibly write something unique? It’s impossible to write something entirely unique, so don’t even try. But that doesn’t mean you can’t put your own unique spin on things. In fact, this is what you should aim to do. If your content isn’t unique in some way, nobody will link to it and you probably won’t rank. Here at Ahrefs, we’re in the unique position of having a wealth of SEO expertise and data at our fingertips. We use that to our advantage quite often. 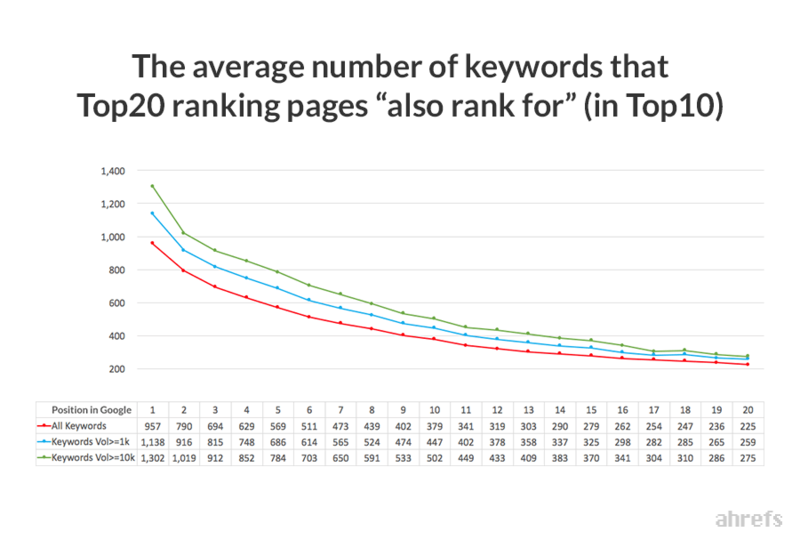 For example, we carry out a lot of studies, such as this one showing how many keywords a page will rank for on average. But sometimes we also write about topics from personal experience, as Tim did in his guide to outreach. Tim is in the unique position of having been on the receiving end of a lot of outreach and sending a lot of outreach emails. So unlike many people, he understands how things work on both sides of the equation, which gives him a unique perspective. We’re also doing this (to an extent) in this guide. Sometimes we carry out mini case studies and experiments (that aren’t reliant on our own data) such as this study into the cost of buying backlinks, or this one where we asked 250 people to tweet an article to see what happened. Sometimes we create a more comprehensive, up-to-date and well-researched guide to a certain topic, such as our recent list of Google advanced search operators or our dwell time guide. And sometimes we use our expertise to provide unique solutions to common problems, such as in this guide to keyword cannibalization. Occasionally, we’ll come across a topic we don’t feel we can cover ourselves (at least not with a unique angle). In such instances, we usually get an “expert” on board. 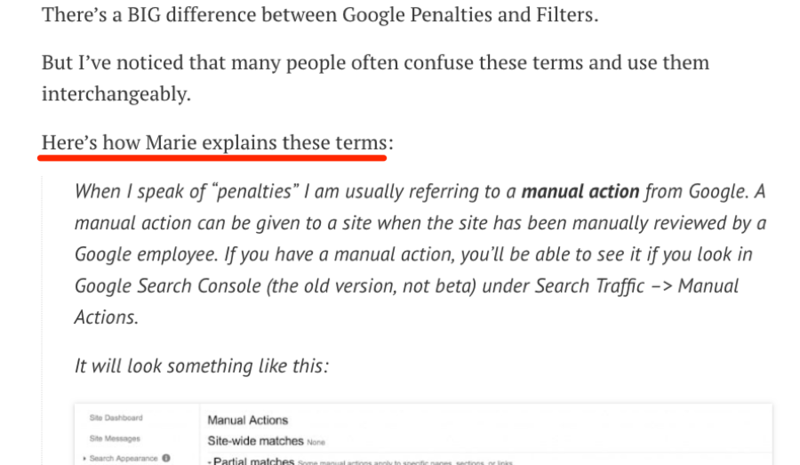 Case in point, our recent Google penalties guide where we interviewed Google penalties expert, Marie Haynes. Bottomline: there’s not much point writing anything unless you can establish a unique angle. You’ll find it difficult to rank with another “me too” post. So once you’ve found your unique angle, draft your post. My advice here: don’t fret too much about the small stuff. Just get the overall idea down on paper (well, Google doc) and refine it later. By now, you should have a rough draft of your post. It probably isn’t perfect, but don’t worry about that for now—we’re first going to tackle the intro. Depending on the quality of your intro, people will either decide that your post is the answer they were looking for (and thus keep reading), or not (and therefore click back to the SERPs). It’s super-important that it does the former rather than the latter. Doing this is all about gaining their trust and showing them that they’re in the right place. In all honesty, we don’t have an exact formula for writing our intros as we don’t believe in a one size fits all approach. Our intros tend to vary depending on search intent and who we think will be searching for this post. 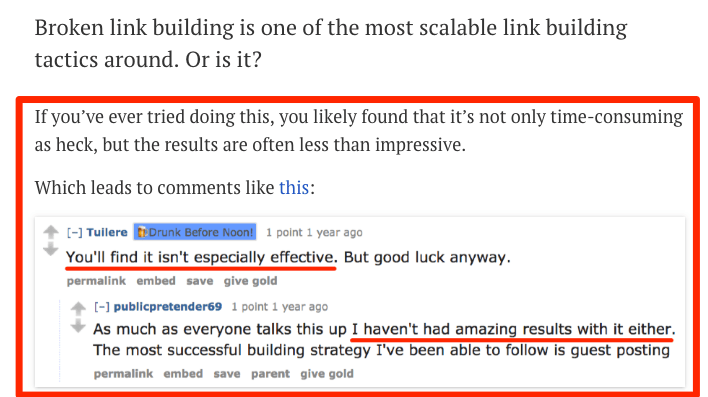 To illustrate, let me share two examples with you, starting with the intro to our broken link building guide. I know from experience that one of the most common issues those who try broken link building face is that it requires a lot of time, and the results are often less than impressive. By stating this right off the bat in the intro, I’m showing that I understand who they are and what their issue is. Then I go on to promise the solution to that issue. That’s all this intro needs. I’ve (hopefully) established their trust and convinced them that I have the solution to their problem. I knew from analyzing the search intent for “SEO tools” (which is pretty obvious, in all honesty) that people were looking for a list of SEO tools. That’s why this one is pretty simple and to the point—they’re looking for SEO tools, so I tell them that’s what they’ve found. But what separates this list from every other list? Why should they trust us? Bingo. Now they know that this is a curated list (i.e., not biased and based on one person’s option) that has been organized into distinct groups. 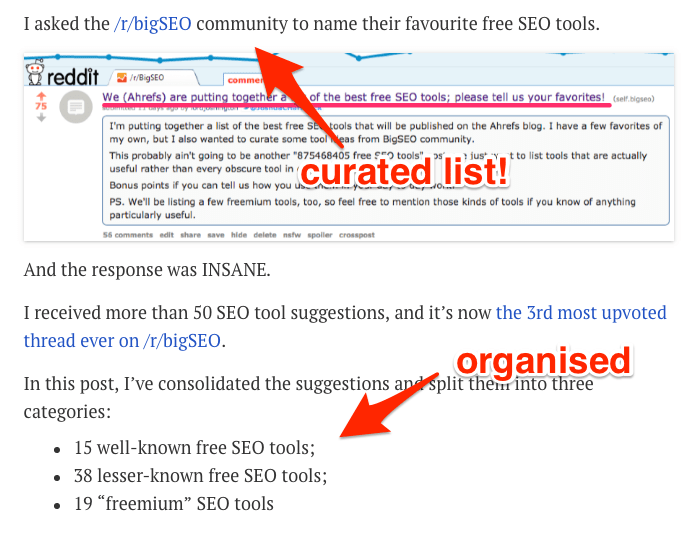 By mentioning that second group of “lesser-known SEO tools,” I’m ensuring that the post also appeals to those who are already familiar with the “big” tools. It lets them know that there are some tools they’re missing out on. Which taps into their FOMO. If that sounds simple, it’s because it is. 6. Make sure people will link to your post, and in the right context too! Earlier in this guide, we found that each of the top-ranking pages for “SEOcopywriting” have roughly 100–300 referring domains pointing to them. Do you really think we’re going to outrank them if we have, say, 30 RDs? Absolutely not—it doesn’t matter how great our post is! That’s why it’s super-important to build “linking triggers” into your post. Basically, pages listing tips about things like increasing website traffic, formatting blog posts, and increasing shares. I.e., all things that SEO copywriting tactics can help with. Let’s be honest, most backlinks don’t come “naturally”—you have to work for them, and that means performing outreach. But if you know who is likely to link to such content (and why), that will aid your prospecting. For example, if you can see that many of the links to similar top ranking content come from posts listing ways to increase website traffic (or whatever it may be in your particular case), then you can search for such pages when prospecting. So this is probably something worth including in our post. But looking even deeper across all posts, I get the feeling that most of the links are the result of a unique insight being shared in that post. For example, as far as I’m aware, Brian Dean was the first person to mention the use of “bucket brigades” in the context of SEO—that’s why he garnered so many links. Nobody likes reading more than they have to. Your aim should always be to remove any unnecessary content and wordiness from your post. So don’t be afraid to take a scalpel to your post and trim any unnecessary junk. I also recommend trying to simplify the remainder of your post and break it down into shorter sentences and paragraphs. This will ensure that your post is easy to digest and less daunting for skimmers. One tool that helps with this is Hemingway app. Just paste your post into the free tool and it’ll highlight lengthy and hard to read sentences, adverbs, and phrases with simpler alternatives. We also run all our posts through Grammarly to highlight spelling and grammatical errors. We use Grammarly Premium but the free version is good too. Use bold, italics, underlines as needed to highlight important points. Then, it’s finally time to upload to WordPress (or whatever blog platform you use) and prepare the post for publishing. We use Wordable for this—I highly recommend it if you’re a WordPress user. You should also take this opportunity to refine the title of your post and create a meta description. Don’t overlook this part. Writing an enticing title and meta description is super-important if you want people to actually click through to your post (which you obviously do). There’s also evidence to suggest that Google takes CTR into account when ranking pages. 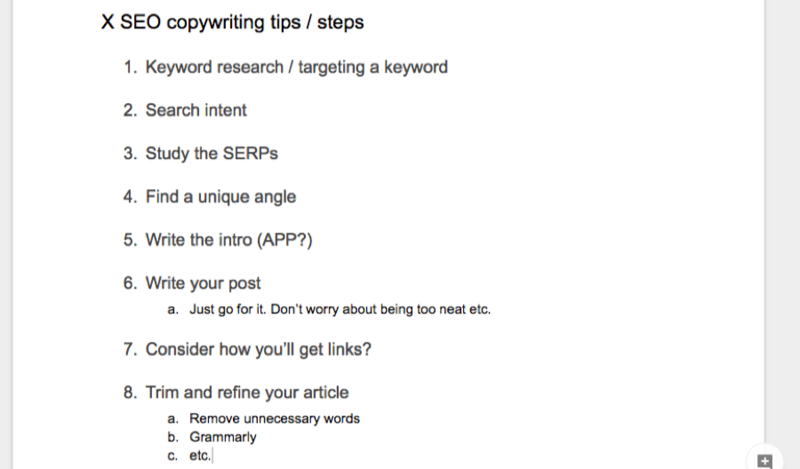 There you have it—a simple 7-step process to SEO copywriting. No need for an overly-technical TF-IDF analysis or even the addition of so-called “LSI keywords.” Just focus on search intent, take a unique angle, engage your readers right off the bat, and attract links to your post. It’s certainly not easy by any stretch of the imagination. In fact, it requires a lot of work. But pull it off, and you’ll receive passive traffic to your blog month after month.